In my recent interview (Part 1 / Part 2) with the LOTRO team we discussed the loot system. They mentioned the possibility of implementing a personal loot system for the upcoming raid to be released with the Fall of 2017 X-Pac. Let’s examine some of the existing loot systems and mechanics within LOTRO such that we can discuss the pros and cons. Mob Kills (Personal) – loot is generated for your individual character that killed the mob [or “tapped”] (landscape and some bosses) and assigned to them. Mob Kills (Group) – loot is generated for the individual characters within a group that killed the mob and it is distributed according to the Loot Rules. Treasure Chest (Personal) – loot is generated for your individual character that earned the treasure chest and directly assigned to you. Treasure Chest (Group) – loot is generated in a chest to be distributed, rolled on, or assigned depending on the Fellowship/Raid Loot Rule. Bind on Acquire – The individual character that received it is the only one that can use it. It cannot be traded or sold on the AH. It cannot be used on another toon on your account. Bind on Equip – You can trade it or sell it on the AH so long as you do not equip it. Once it has been equipped it is bound to the character that equipped it. Bound to Account – You can send it to any character on your account via mail or storage. It cannot be traded to others not on your account or sold on the AH. Currency (bound to character) – You can only spend the currency on the character that earned it. Currency (bound to account) – You can spend the currency on any character on your account. When grouping, the leader sets the Loot Rules. There are 5 possible choices (most common are Roll/Pass and Master Looter) for how loot is distributed and a setting for what level of loot quality (none, uncommon, common, etc.) these rules kick in. Free For All – The first person to open the chest gets the loot. Free For All With Need/Greed/Pass – When there is loot, everyone will have the opportunity to press the Need, Greed, or Pass button on loot at, or above, the loot quality setting. All those that pressed Need will have a number between 1 and 100 assigned to them; the highest number wins. If no one chose Need then the process is repeated for all those that chose Greed. All loot below the loot quality setting goes to the person that opened the chest first. Round Robin With Need/Greed/Pass – When there is loot, everyone will have the opportunity to press the Need, Greed, or Pass button on all loot at, or above, the loot quality setting. All those that pressed Need will have a number between 1 and 100 assigned to them; the highest number wins. If no one chose Need then the process is repeated for all those that chose Greed. All loot below the loot quality setting is assigned on a round robin basis. Round Robin With Roll/Pass – This is the most commonly used setting. When there is loot, everyone has the opportunity to press the Roll or Pass button on each item at, or above, the loot quality setting. Each person that chose roll will have a number between 1 and 100 randomly assigned to them; the highest number wins. All loot below the loot quality setting is assigned on a round robin basis. 1) Everyone rolls (by typing /roll) and the highest gets the item. 2) DKP (Dragon Kill Points) or Kin Points can be spent to claim an item (these systems are managed within kins). The leader assigns the item to those bidding the highest. All loot below the loot quality setting goes to the first person that opened the chest. All loot below the loot quality setting is distributed in a round robin fashion. There are several loot tables (databases) from which the quantity and type of loot available is determined. All the possible loot rewards are grouped in to one of 5 tables; Common, Uncommon, Rare, Incomparable, and Epic. This is a system based solely on chance. It is used most commonly for “trash” loot after killing a landscape monster. Upon killing the monster, an RNG assigns how many pieces of trash loot you will get; “x” from each predetermined table for that monster. Then a random number is generated (“die roll”) “x” times. These numbers are matched against a Loot Table of equally weighted items (same chance of getting each item). Each roll is checked for 2 things; can you receive duplicate items, and is the loot available for the mob that you killed. As a result, you will receive; 10 Silver Coins, 1 Mossy Carapace, and 1 Blackened Filth. Disadvantage: The loot can be extremely frustrating to achieve. Advantage: It keeps players running the content over and over chasing the “carrot.” This provides longevity to the content. This system is used to assign rarity to individual items and is commonly used for loot from boss kills and treasure chests. When a chest spawns, a formula (incorporates an RNG) will determine how many pieces of loot from each Loot Table (Common, Uncommon, Rare, Incomparable, and Epic) will be in it. Killing this particular boss (Shelob) results in a chest that only spawns Common, Incomparable, and Unique loot. An RNG then determines how many items from each loot table you get (Tables 2-4). The results were 4 from the Common Table, 4 from the Incomparable Table, and 1 from the Unique Table. RNG rolls are then conducted for each table (as in the tRNG example above) to determine what drops. As you can see the Common Table is equally distributed; there is a 25% chance of achieving each item. In the Incomparable Table the loot has a weighted distribution; the Shelob Crest and the Universal Solvent have better odds of dropping (25%) than the Anfalas Star-lit Crystal (5%). The Unique Table is weighted to the extreme, with only a 0.5% chance of the Fang of Shelob dropping. Disadvantage: The weighted loot can be extremely frustrating to achieve. It leads to grind and burn out. This type of loot distribution can rely on tRNG, wRNG, or no RNG. In order to help prevent the grind of having to deal solely on an RNG to achieve a specific piece of loot, PCS systems are used. Example; in a tRNG or wRNG system (as described above) you must rely on the RNG to award you specific pieces of gear. If you do not get the specific piece of gear you want, you have to complete the fight again and again until you get it. This is common when an instance drops pieces of armour or jewelry. Completing the instance can reward a Helmet, Gloves, or Boots. Each time you run it you have no choice in what the RNG assigns (you could get Boots 10 times in a row). To mitigate grind and frustration the instance can drop an Armour Box or a currency, which if won by the player can be used to choose the Helmet, Gloves, or Boots. If the player completes the instance enough times and wins the Armour Box 3 times they are assured of completing the set. Like the above tRNG / wRNG systems the reward (in this case an Armour Box or currency) is distributed via the RNG systems. So getting the box is not guaranteed, but if you win it the choice of reward is guaranteed. Disadvantage: Still relies on an RNG. Advantage: If you win the Armour Box you have a choice of rewards. This system would guarantee that upon completion of the instance you receive the reward (in this case an Armour Box or currency). Completing the instance X times would guarantee you a full set of Helmet, Gloves, and Boots. Disadvantage: In a very short period of time the player has exhausted the desirable rewards and the content becomes less attractive. Advantage: If you complete the content once you are guaranteed the reward. The reward is gated behind completing a deed (or deeds). Let’s use the example of the Fang of Shelob from above. In the wRNG system above you have a 0.5% chance of the Fang of Shelob dropping and then a 1 in 12 chance of winning the roll in a Master Looter scenario within a 12 person raid. In a Deed Based System a player that completes the instance at T2C “x” times (assuming the item is gated behind T2C content) would automatically receive the Fang of Shelob. Disadvantage: You have to complete the content “x” times to receive the reward. Advantage: If you complete the content “x” times you are guaranteed to receive the award. There is no RNG involved. 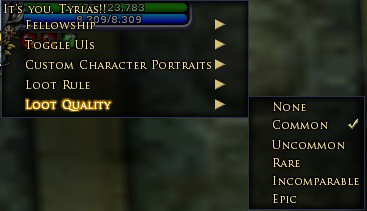 The majority of the loot in LOTRO drops in a chest and is bound by the Loot Rules defined by the leader of the group. A Personal Loot System would ignore the Loot Rules and assign rewards directly to the players. Let’s use the Fang of Shelob example again. In the wRNG system above you have a 0.5% chance of the Fang of Shelob dropping and then a 1 in 12 chance of winning the roll in a Master Looter (Loot Rule) scenario within a 12 person raid. In a PLS you would have a 0.5% chance of the Fang of Shelob being rewarded directly to you. Disadvantage: Many kins like to use DKP (Dragon Kill Points) or Raid Points or some other currency to determine how loot should be distributed within the group; the PLS would eliminate this possibility. It eliminates the luck of a roll. You could have someone in the group who already has the Fang of Shelob receive it again without the opportunity to pass on it so others could get it. Advantage: It eliminates the possibility of “ninja looting,” and it eliminates the further RNG of a roll within the group once the item has dropped. While the scenarios above may be overly simplistic compared to the mathematics and equations that actually run in the background, they are representative of the genres out there. Each one has its advantages and disadvantages. Standing Stone Games is in the planning stages of a raid for an X-Pac release in the Fall of 2017. Let’s give them some proactive feedback on what the loot system for this raid should look like. I personally feel they should be implementing gear that drops in the raid that has bonuses that are only active while in the raid. This would keep the raiders happy with achieving best in class gear but not exclude the non-raiders. The non-raiders could get gear with the same stats but not bonuses that activate within the raid. Anyone wearing the raid armour outside of the raid would have the exact stats as those with non-raid armour. If you have found this information to be helpful please consider making a small donation to buy me a coffee (or beer) by clicking the button below.